Re: New Zealand [5.2.12] V10-P7 - Gameplay Stamp perhaps? AndyDufresne wrote:In regards to Southland, even if it is in a corner, it seems hard for me to say it is equally valuable as Auckland and Wellington, it seems worth more. 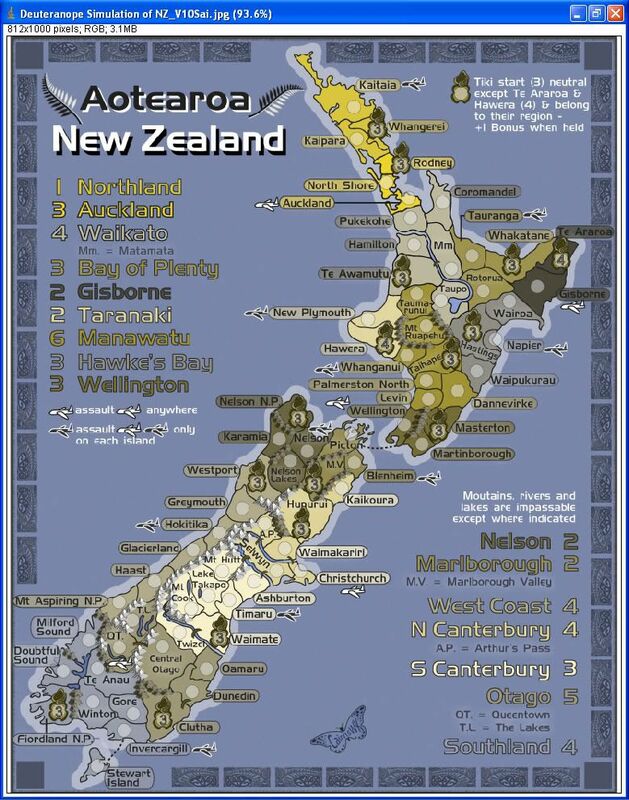 Andy, i kinda agree about Southland, i think it's worth +4 - it has 8 territories, 3 of which are natural borders, and 1 of those is a black plane being able to be assaulted from 4 other terrs, effectively giving it 7 bordering terrs that can attack it. my main point of reference is classic north america, which has one more region, but is attacked by only 3 bonus zones instead of 5. i agree that all 3 borders being connected is not enough advantage to reduce the bonus by 1, so +4 (excluding the tiki) is appropriate. OK. that's agreed. +4 for Southland. cairnswk wrote:Before i go further, and i appologise to any who has already suggested it, does anyone want to split Canterbury...re-exmaing the regions now it is simply too large. What about a split Ashburton-Mt Hutt and Selwyn? if u want to split canterbury into north and south, then that's the logical place to do it. OK, i'll do that and see what the bonuses are. by the way, i really dislike the mouths of the rivers being closed off instead of running into the ocean. 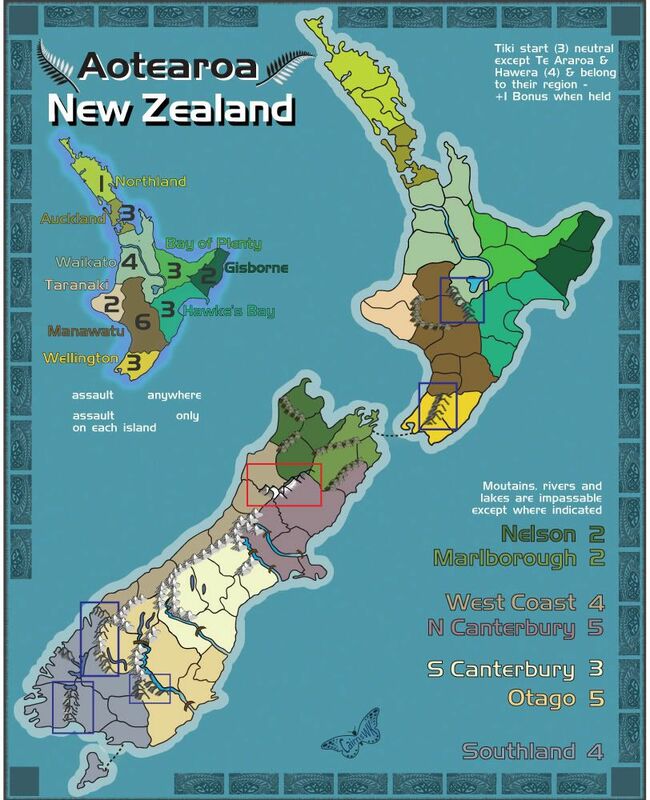 For gameplay reasons Northland and Auckland held together needs to have 3 borders! Otherwise in 1v1 games it'll only be about who can hold those bonuses. I suggest making a dotted connection between Whangerei and Coromandel. so my question is...should this link still be removed on the above...? Last edited by cairnswk on Thu Feb 16, 2012 5:00 pm, edited 2 times in total. Re: New Zealand [15.1.12] V8 P5 - Gameplay Done? northland: drop from +2 to +1 because of the end-of-map location, but remove the ferry route, which is rendered unnecessary by kataia airport. auckland: raise from +2 to +3 because of the one-way assaults. waikato: drop from +6 to +4 because of lack of airport, but remove the ferry route to discount northland as an enemy zone. bay of plenty: no change at +3. gisborne: no change at +2. taranaki: drop from +2 to +1 because it's in the nearest thing on this map to a corner location. I re-thought this one ian...i think it could be a +2 due to the fact it's got a +4 and +6 either side of it, and is assaultable from 4 other airports? manawatu: no change at +6. hawke's bay: drop from +4 to +3 because of having only 4 regions. wellington: raise from +2 to +3 because of the one-way assaults, which more than compensates for having only 3 regions. nelson: drop from +3 to +2 because of the near-corner location. marlborough: drop from +3 to +2 because of having only 3 regions. west coast: perhaps raise from +3 to +4 unless u block off either nelson lakes or karamia (a marginal case). canterbury: raise from +6 to +8 because of the one-way assaults, two airports and large number of regions. otago: no change at +5, since the removal of dunedin airport is cancelled out by one-way assaults to queenstown. southland: drop from +4 to +3 because of the end-of-map location. The rivers are now fixed in V10 above. cairnswk wrote: The rivers are now fixed in V10 above. although i still think +1 is more suitable (compared with gisborne, for example), i can see ur reasoning if u want a +2 for taranaki. iancanton wrote: canterbury: raise from +6 to +8 because of the one-way assaults, two airports and large number of regions. not sure why u've reduced north canterbury so much. i'm fully in agreement with ur spreadsheet: 5 borders plus one-way attacks against the white airport means +5 (excluding the tiki). other than this, i'm completely happy with what u have. Ian, sorry, do you mean S canterbury? S canterbury is +5 on the spreadsheet...N canterbury is +7, so i'm a little confused as to which region you're talking about. Could you clarify please. Also i looked at N Canterbury and it already has 1 tiki bonus and only needs 4 other forts to covers its borders. It has 6 terrs while S Canterbury has 7 terrs. I thought it would be easier to holder this than the S Canterbury. cairnswk wrote: Ian, sorry, do you mean S canterbury? S canterbury is +5 on the spreadsheet...N canterbury is +7, so i'm a little confused as to which region you're talking about. Could you clarify please. i'm agreeing with north canterbury's +6.5 on the spreadsheet: +5.5 normal and +1 tiki. given the 5 borders, including one-way attacks to christchurch, we need at least +5 normal and +1 tiki, which matches the spreadsheet's +6.5 rounded downward. south canterbury is fine at +3 normal and +1 tiki. the spreadsheet gives +4.58, which can go either way and u've chosen downward. compared with north canterbury, downward is correct because there are only 3 borders, no one-way attacks into timaru and one of the smallest numbers of adjacent enemy bonus zones on the map. to help those whose vision isn't so good, may i suggest using the auckland colour in hawke's bay and vice versa? hawke's bay and bay of plenty are very similar in shade. having the bright yellow auckland colour in hawke's bay provides much-needed contrast. ian, thanks for the clarification on those. Will attend to next version in the next few days. 2. Auckaland colour to Wellington; Manawatu colour to Auckland: Wellington colour to Manawatu to overcome the closeness of colur issue ian had - but not pur a big section of bright yellow in Manawatu as it would have been too dominant on the map. Hmmm ... I think that Otago and S Canterbury's colors could be switched. Otago is too close to West Coast, and S Canterbury is too close to N Canterbury in the CB test. isaiah40 wrote: Hmmm ... I think that Otago and S Canterbury's colors could be switched. Otago is too close to West Coast, and S Canterbury is too close to N Canterbury in the CB test. Wouldn't that still make the S Caterbury and West Coast CB colours too close. I'll keep searching for a solution that makes good aesthetics on the map also. On my monitor, I they wouldn't be close at all. Oh, well on mine it tells a different story. Guys, you need to calibrate your monitors. natty dread wrote: Guys, you need to calibrate your monitors. OK, please tell us how to do that, i haven't changed my monitor or adjusted any controls on it since i got over fours years ago. Was there a colour profile (.icm) file provided with your monitor? If not, the monitor manufacturer might provide one on their website... they're usually in the same place where they provide driver updates and such. After you have the colour profile file, you need to go to the display settings (if you use windows) and there to the advanced settings, and there should be a tab where you can select the colour profile to use - there, add the colour profile you downloaded and set your system to use it. Alternatively, your monitor might have an option in it's settings to use the sRGB colourspace, in which case you can use the standard sRGB colour profile, which should be installed in your system by default. natty dread wrote: Was there a colour profile (.icm) file provided with your monitor? There probably was, but i have also changed my computer but not the monitor - Asus VW192T Splendid. I have nwo changed the colour profile to sRGB colourspace, so i'll see if there is any difference. Thanks for your assistance on that. Much appreciated. Guys, the colors look fine on my screen. Well, everything looks a little green. In all seriousness, this map is growing on me more and more. AndyDufresne wrote: Guys, the colors look fine on my screen. Well, everything looks a little green. Nice humour Andy, enough to lighten my mood. Boy, tax is going to be hard this semester! Anyways, a couple of colour changes on the South Island...plus the CB test to go with it. Oh...and i have to ask...minimap for the bonuses or as is/similar to now? The way the bonuses are described right now seems perfectly clear. I see no need for a minimap. ender516 wrote: The way the bonuses are described right now seems perfectly clear. I see no need for a minimap. The reason i asked this question is that i am feeling the current text style while adequate because of colouration etc, couldn't be improved upon with a visual representation as well as text. Now i say as well as text because one of the reasons i do these maps apart from enjoyment for players etc and myself, has a sub-motive of education. That is one of the reasons i started with the CCC map. 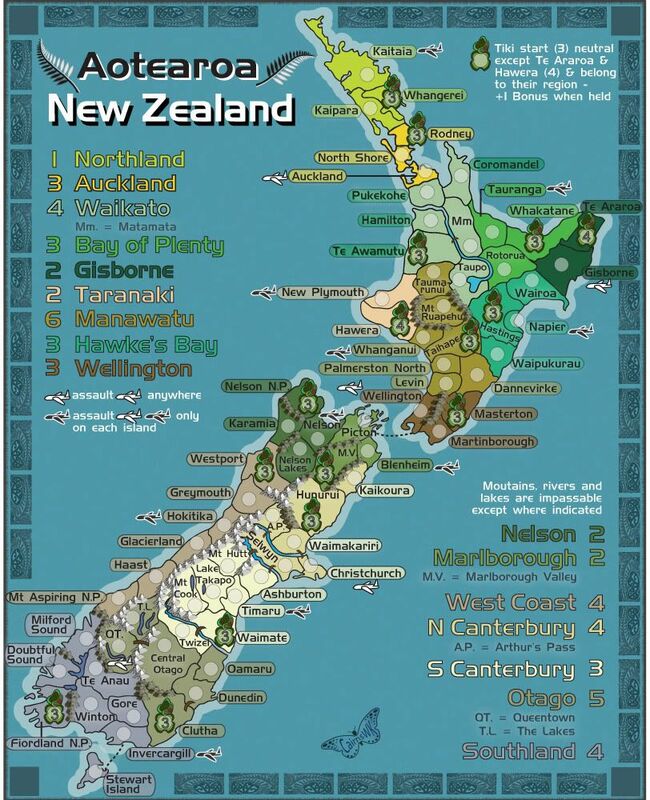 IN this case, if players can see where the Bay of Plenty is then they are more likely to remember it by playing the map over a couple of times if it is good enough for them to do so. So below is an example of what the North Island might look like. What do you think? I think the mini-map here works out very well!! Just move the abbreviation down between the mini-map and airport instructions and it will be perfect! From the above image Version 12 map...much of the clutter has been removed so people can see more clearly what they are voting for. You have two options to vote for and votes are changeable should you wish. Please only place one vote in Mountains and one vote for Legends.